Mark Cavendish (Omega Pharma-Quick-step) took his fourth consecutive stage of the Tour of Qatar to wrap up overall victory and claim only the second stage race of his professional career. In terms of the competition and the prestige, however, Qatar ranks higher than his previous win, at last year’s Ster ZLM. There, Cavendish was a lean climbing machine and didn’t win any stages as he built towards the London Olympics. 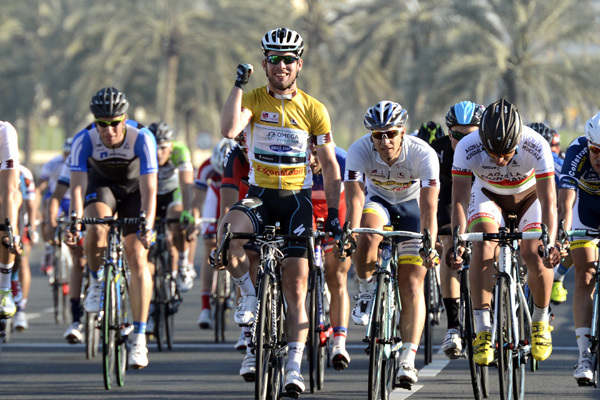 Here in Qatar, Cavendish has been back to his very best. Together with his win at the Tour de San Luis in Argentina, he now has six victories in 2013, his best haul so early in the season, and a testament to his form, which appears even better than 2009, when he won Milan-San Remo. He has been talking down his prospects for a second San Remo, but he was similarly dismissisive of his chances of winning the overall in Qatar for most of the race. It was only on the eve of the final stage that he finally admitted the possibility. 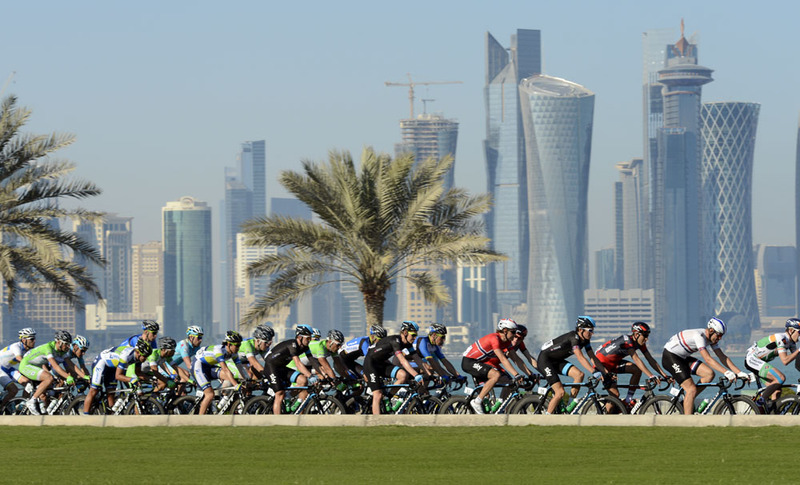 And on the Corniche in Doha, after a short final stage, he finished in style by once again emerging at the front to claim the win by a wheel from Yauheni Hutarovich (Ag2r) with young Dutchman Barry Markus (Vacansoleil) third, fellow Brit Adam Blythe fourth and his BMC teammate Taylor Phinney fifth. Phinney and Blythe finished third and fourth overall, with another BMC rider, Brent Bookwalter, second. The stage was not quite incident-free for Cavendish, who crashed after 15km. He suffered cuts and grazes to his elbow and knee and was patched up after the stage, but he admitted he had no idea what caused it. “I said this morning that I’ve won this stage and crashed heavily [last year] and I came off again,” he said. “I don’t know what happened, but it’s bike racing. Someone has to fall off.